NASA image by Burgess Howell, SERVIR Global program. Caption by Adam Voiland, NASA Earth Observatory. On April 28, 2014, a powerful tornado passed through Louisville, Mississippi. The ISS SERVIR Environmental Research and Visualization System (ISERV) on the International Space Station captured this photograph showing damaged vegetation and debris left behind by the storm. ISERV acquired the image on May 4, 2014. The tornado left a scar 58 kilometers (36 miles) long and up to 1.3 kilometers (0.8 miles) wide. With winds that topped 297 kilometers (185 miles), the storm was rated an EF4 on the enhanced Fujita scale. Ten residents of Winston County died as a result of the storm. At least nine tornadoes hit Mississippi that day, including EF3 tornadoes in Tupelo and Richland. The tornadoes were part of a larger weather pattern that produced about 79 tornadoes from Nebraska to North Carolina between April 27–29. 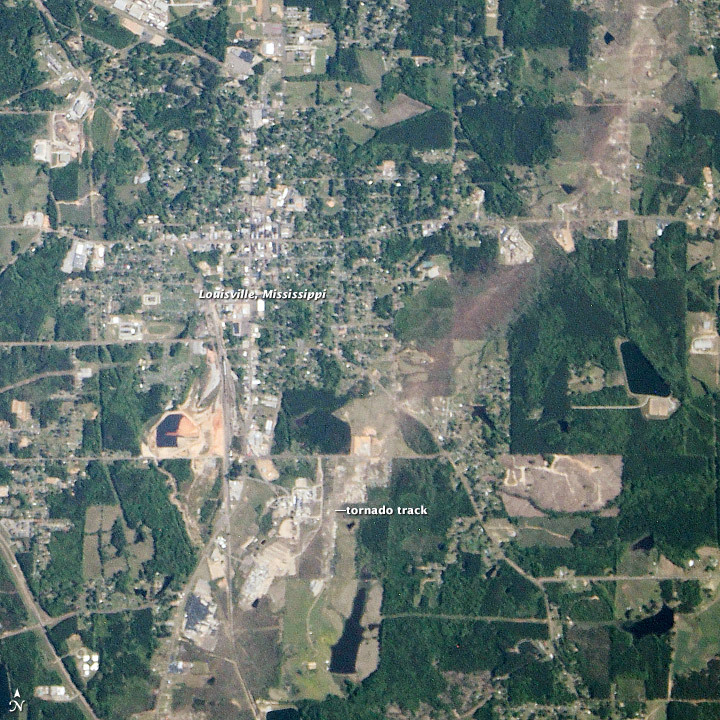 On May 2, the Earth-Observing 1 satellite captured a similar image of tornado damage in Mayflower, Arkansas. Clarion-Ledger (2014, May 9) Memorial service for Louisville tornado victims planned. Accessed May 12, 2014. Clarion-Ledger (2014, May) Six Hours of Hell. Accessed May 12, 2014. NPR (2014, May 9) Louisville, Mississippi, Rebuilds After Tornado. Accessed May 12, 2014. 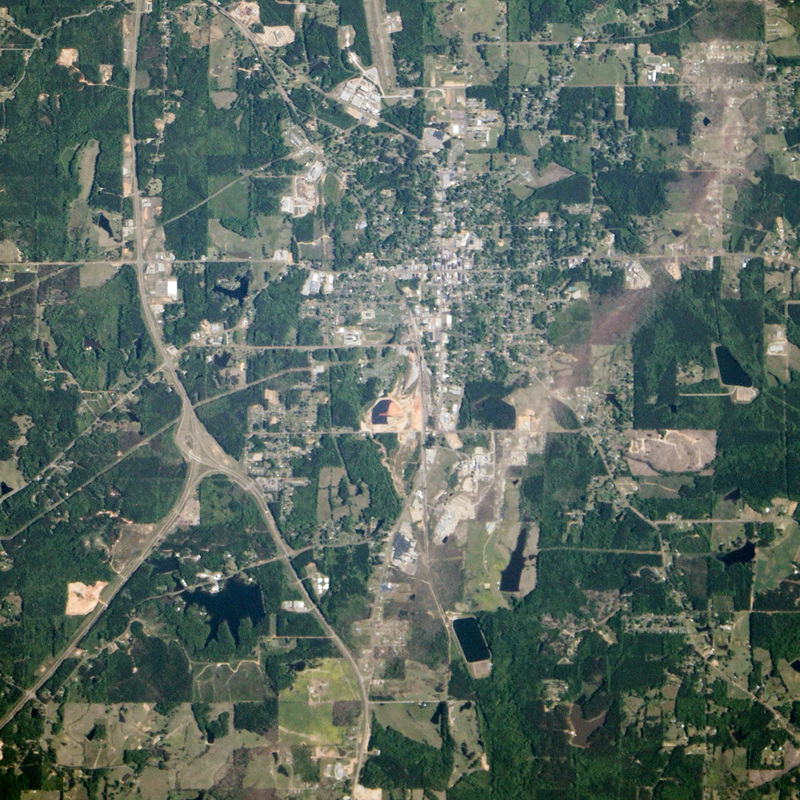 SERVIR (2014, May 8) ISERV, SERVIR’s International Space Station camera, reveals path scoured by Louisville, Mississippi tornado. Accessed May 12, 2014.